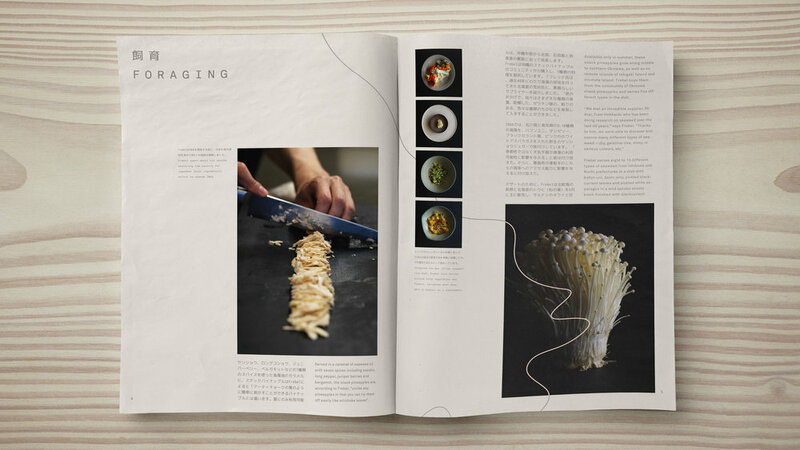 Translating Noma’s Nordic techniques through the rich palette of Japan. 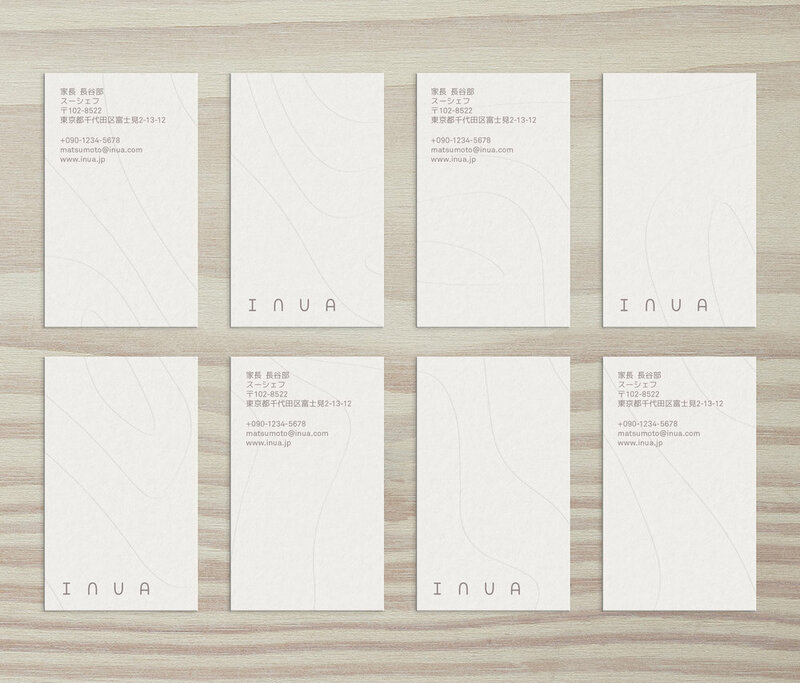 Inua is René Redzepi’s first restaurant in Japan, lead by former Noma chef Thomas Frebel. Danish philosophy dictates that food should connect diners to time and place. Inua translates this idea for Japan – applying contemporary Nordic techniques to the unique palette of Japanese ingredients. The name Inua comes from Inuit culture, and describes the life force that binds all natural things together – the land, its plants, its animals, and its people. 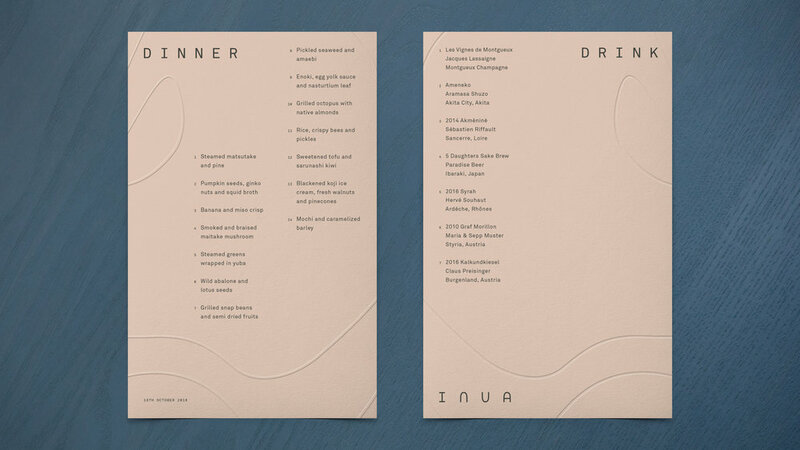 Referencing Inuit mythology, we created a brand idea to fit and augment Inua’s cooking style: “All things separate yet together.” The brand identity balances the primitive and the refined, and is purposefully minimal to echo the simplicity at the core of both philosophies, while connecting disparate pieces, influences and cultures. Primitive and refined, symmetry and asymmetry. Inspired by forms found in natural materials. A graphic system that represents binding energy, tension, connection and flow. The elegant lines radiate organically with tapering line thickness. The field appears differently in each application to give the feeling of an ever changing energy.